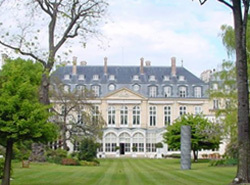 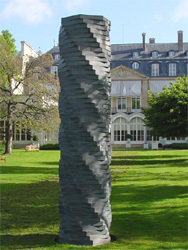 'Extended Shadow' stands in the garden of the British Ambassador's Residence in Paris. 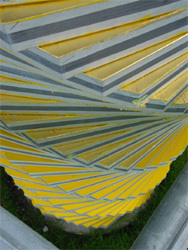 It is formed from stacked, lead octagons, and the upper and lower surfaces of the exposed edges are leaf gilded. 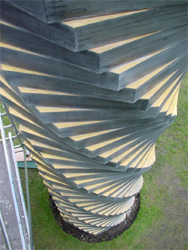 The gilded sections had become worn and the lead surfaces were affected by limescale from garden sprinklers. 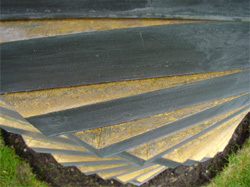 Firstly, the lead surfaces were carefully cleaned to remove all limescale, algae and dirt. 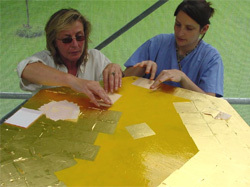 The gilded sections were then carefully masked off so that a coat of primer paint could be applied to each triangular section.This was followed by the application of oil size and two layers of 24 carat gold leaf.